*Free $50 Piping, $45 Pearl, and $35 Elastic/Tape Feet are added to the Standard Accessories : Gathering/Ruffling Foot, Multi Purpose Blindstitch Foot, and Standard Serger/Rolled Hem Foot. Finish edges and hems - professionally, and affordably! Designed for finishing the edges and hems of a wide range of fabrics, including formal wear, linens and stretchy fabrics, and for creating ruffles and decorative edges, the Brother™ 1034D Serger is the perfect addition to any sewing room. This reliable, easy to learn and use 3 / 4 thread serger features 22 built-in stitch functions, and snap-on, interchangeable creative feet. Stitch options include 4 thread overlock, 3 thread overlock, narrow hem, rolled hem, and ribbon lock stitches. With its differential fabric feed, the 1034D helps you achieve better stitch quality, for a more even, professional finish, even on very thin or stretchy fabrics. Threading is easy, with the color-coded upper thread guides and lower looper threading system. Plus, the included snap-on presser feet allow for quick and easy changes to transition to each desired stitch. To help you get started, the 1034D includes an instructional video, and a complete, printed instructional manual in English and Spanish. Give a professional look to your next project with serged seam finishes. Seams lie flatter and look better with an overlock stitch. Home decor projects often suggest the use of a serger for rolled hems and secure seams and differential feed. Choose from a 3 or 4 thread look and enjoy the new and easy threading method. The 1034D features two needles and ¾ thread with differential feed. Create stitches from 2.0 to 4.0 mm in length. Differential feed ratio of 0.7 – 2.0 gives improved stitch quality. Free arm makes it easier to sew sleeves, trouser legs and other hard to reach places. Self-threading Lower Looper so you only open one door to thread. Ideal for sewing decorative and finishing stitches on linens, formal wear, and stretchy fabric, this 3/4 serger from Brother includes 22 built-in stitch functions and interchangeable creative feet. Its color-coded set up is convenient, quick, and straightforward, and the foot pedal offers sensitive speed control. For added efficiency and precision, the machine includes stitch width control, outside differential feed control, lay-in threading, the F.A.S.T. lower looper threading system, and an easy-to-remove stitch finger for narrow or rolled edges. It calls for standard sewing machine needles, and its flat surface converts to free arm for pant hems and cuffs. The serger comes with a full set of starter accessories, including a soft cover, a blind hem/multipurpose guide foot, a gathering foot, and a set of needles. A cleaning brush keep operation tidy. From the Brother™ serger collection, the 1034D serger is ideal for sewing decorative and finishing stitches on linens, formal wear and stretchy fabric, this 3/4 serger includes 22 built-in stitch functions and interchangeable creative feet. 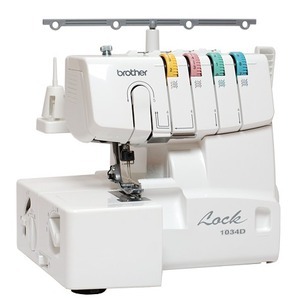 The Brother 1034D Serger features a 3/4 lay-in thread system with lower looper threader. Stitch options include 4 thread overlock, 3 thread overlock, narrow hem, rolled hem, and ribbon lock stitches. In addition the machine has a free arm/flat bed convertible sewing surface and offers a F.A.S.T. lower looper threading system for easy thread changes. The differential feed improves sewing results on stretch or thin fabrics to give you a perfect finish. Snap-on presser feet allow quick and easy changes to transition to each desired stitch. The 1034D also includes an instructional CD to make serging fast, easy and fun. 3 / 4 thread: Easily create precise, professional-quality seam finishing and rolled hems with the 3- or 4-thread cut and sew serger stitches. Versatile stitch options: Choose from 4 thread overlock, 3 thread overlock, narrow hem, rolled hem, and ribbon lock stitches. Differential fabric feed for better stitch quality: The differential fabric feed helps improve the stitch quality on virtually all types of fabric, especially important when sewing stretchy, knitted, or thin fabrics. Differential feed ratio is 0.7 to 2.0. Easy threading: The 1034D has easy to follow, color-coded lay-in threading, and the lower looper threading system is designed to make sure the thread stays right in place. Fast, up to 1300 stitches per minute: Saves time, and delivers high quality stitching, even at up to a high 1300 spm speed. Adjustable stitch width: The stitch width can be easily adjusted between 3.00mm to 7.00mm, helping to provide the perfect stitch width for your project. Adjustable foot pressure: The pressure of the presser foot is fully adjustable, to help ensure consistently highly quality stitching on both heavy and light fabrics. Loosening the pressure for lightweight materials will help prevent puckering, and will allow for easier sewing of curves. 2-point thread tension control: The pre-tension device allows for smoother delivery of thread, and the tension for each needle can also be individually adjusted, for even more precise control for each type of thread. Removable free arm: Simply slide off the removable arm to serge cylindrical items such as sleeves. Retractable knife: The retractable knife blade helps prevent against accidentally cutting your fabric when you're working close to the edges of rolled hems. Brightly lit workspace: No more task lights needed, as brilliant light floods the needle area. Safety feature: For your safety, the 1034D will operate only when the front cover is closed. Uses standard sewing machine needles: No need to purchase special needles – the 1034D can use most standard home sewing machine needles. Built-in storage: Store your accessory tools on the front panel flip-down door. Bilingual operation manual and instructional CD: The 1034D comes complete with an instructional video, and a printed, English and Spanish operation manual. Warranty 1/5/25 year serger warranty. See serger warranty for details. Machine Dimensions (H x W x D) 13.4" x 11.96" x 11.16"
*Free $50 Piping, $45 Pearl, and $35 Elastic Feet are added to the Standard Accessories : Gathering/Ruffling Foot, Multi Purpose Blindstitch Foot, and Standard Serger/Rolled Hem Foot. Brother 1034D on the internet and 3034D only in dealer stores are exactly the same machine with only cosmetic/color differences. We stock the 1034D for internet customers and 3034D for our retail store customers. We are not allowed by Brother to advertise the price of 3034D on the internet. I want to get a machine that will allow me serging and/or coverstiching on ANY kind of fabric! I am undecided among three of the machines you sell: the Juki MO735, the Brother 2340CV and 1034. I mainly would like to know what the differences among them are, and if such differences would justify the difference in pricing. It is sometimes hard for me to understand the difference between flatlock and overlock, for example, so not knowing how I could use them in different situations, it doesn't make much sense to get a machine that has them both? So from your expert opinion, which one you would recommend based on what I'm looking for?. Would you recommend that, instead I buy two separate serger and a coverstitch? What would be the main reason for me to buy the MO735 instead of the two others, considering it's more expensive? The 2-thread stitch is for overcasting a single layer of fabric. It does not have the seam, only the overcast. Of course, you can overcast with the 3 or 4 thread stiches as well. The overlock stitch is a seam with overcast built in. It can be 3, 4 or 5 threads. 3 thread would be for very light weight fabrics, since it's narrower. 3 and 4 thread stitches have stretch, so they are the best stitches for knits, but can also be used on wovens. 4 thread stitch is wider than 3 thread stitch, so it is better for medium weight fabrics. The 5-thread stitch is a straight chain stitch and a 3 thread overlock (separate) and is for heavier fabrics and wovens, since it does not stretch. Flatlock is a variation of the 2-thread or 3 thread overlock stitches. The tension is adjusted so there is no seam, only the overcast. When you sew 2 layers together and pull them flat, the seam allowances are enclosed, so they do not stich out to fold to one side or the other. The fabric is pulled "flat." On one side the stitch looks like a normal overlock stitch. On the other side it has threads going crosswise, like a ladder. The stitch is often used decoratively with special threads in the looper. It is used for patchwork or knit garment seams. It's nice to have a serger and a separate coverstitch machine, especially if you will use the coverstith often. It saves you time converting from one stitch to the other. However, that's not always practical, space-wise. Once you've made the change a couple of times, it will become quicker and eeasier for you. You can leave the chain stitch looper thread (also used for the coverstitch) through the threading path (except the eye of the looper), so you can tie on and pull new threads through, thus saving a lot of time when you make changes. The sergers and coverstitch machines you listed are all good quality. None are made in Japan. However, the production is supervised by the Japanese and we have not noticed any quality problems since the production was shifted out of Japan. The advantage of the Juki MO735 is that it is the most heavy-duty machine, since Juki uses their industrial parts and expertise in its manufacture: http://www.allbrands.com/products/abp05031-0267.html. The advantage of the Brother 2340CV at is that its coverstitch is a little bit wider and it has some wonderful accessories to help you guide your fabric for various operations: http://www.allbrands.com/products/abp06948-0263.html. My first choice would be to get one of the Juki 4 or 5 thread sergers and the Brother coverstitch only machine. We also carry the Brother 1034D serger, which has many more features than most sergers and comes at a great price. If you want only one machine, I'd get the Juki MO735. Hope this helps. Let me know if you have any more questions. We look forward to serving your equipment needs. Great and fast delivery!!! Very excited about my new Brother serger. it took me awhile to learn all the things it does. It is amazing! I have the first domestic serger Brother made about 30 yrs old (by the way it still works)! I used to live in Baton Rouge back in late 70's and used to go to your store on Florida Blvd. to buy heirloom fabrics and lace and see the sewing machines. I am so impress at All Brands' success over the years. Your customer services has been outstanding! !